Our homes may feel safe since they protect us and our belongings from the cold, rain, snow, and wind; however there is more to a safe house than just having locking doors and an alarm system. Carbon monoxide poisoning causes over 200 deaths a year and fires cause thousands of deaths each year in the US. 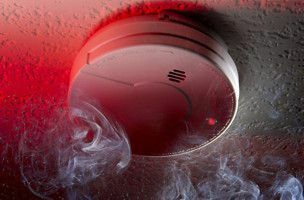 To protect yourself from these harmful, and possibly deadly occurrences, be sure to install fire and CO detectors in the proper areas and maintain/test them with regularity. Here are some guidelines that are recommended by the National Fire Protection Association and the US Fire Association. Install smoke alarms inside every bedroom, within every separate sleeping area, and on every floor of the home. Smoke rises, so be sure to place them high on the wall or ceiling. There are several different types of smoke alarms: photoelectric is more sensitive to smoldering fires, and ionization alarms are more responsive to flaming fires. For the best protection, you may want to purchase a smoke alarm that uses both sensors. Use a photoelectric alarm close to the kitchen. Test alarms weekly by pressing the “test” button on the alarm. Replace batteries in smoke alarms at least once a year, or whenever the alarm starts to chirp (signaling a low battery). Replace the entire unit every 10 years, regardless of whether it is a battery, long-life battery, or hard-wired unit. Keep a fire extinguisher on every floor and one in the garage and kitchen. Since all fires start small, you may be able to prevent heavy damage with a fire extinguisher that is within quick reach! Even though carbon monoxide (CO) only causes a couple of hundred deaths a year, carbon monoxide related incidents were documented in over 80,000 homes during 2010. To protect yourself from carbon monoxide poisoning and other harmful effects of CO, be sure to take these safety tips. Install CO detectors in a central location outside each sleeping area and on every level of the home and in other locations where required by applicable codes or laws. CO is termed the ‘silent killer’ since it is odorless and colorless, which makes it so important to have one installed on each sleeping level of your home. Be sure to read the instructions closely and keep them away from sources that may throw readings off, such as doors, windows, or vents for heating/cooling. Test them once a month with the ‘test’ button on the alarm. Recommended to replace every 7 years, because the sensors get dirty and will cause inaccurate readings. Never use portable generators inside home or garages, even if doors and window are open. Never bring a gas or charcoal grill inside the home to cook (this includes the garage). Never use a gas range or oven for heating the home. Be sure to open the fireplace damper before lighting a fire and keep it open until the ashes are cool. Never run a car inside the garage and always wait to start the car until the garage door has been opened. This goes for other gasoline or propane run tools; Be sure to take these tools outside when starting them.